Motorcycle Passengers Have To Think About Safety, Too! Motorcycle passengers can’t just sit back and enjoy the ride. They have responsibilities on the bike, too! 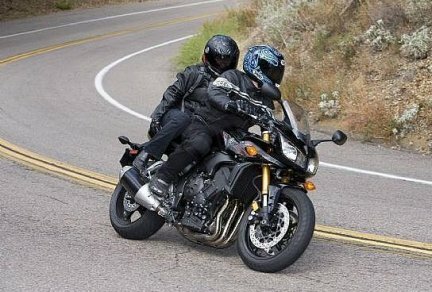 Most of my motorcycle blog posts have been directed at keeping motorcyclists safe, but motosport.com has a great post worth reading that prepares passengers for their first ride. There is more to riding as a passenger than borrowing a friend’s helmet and jumping on the back of a motorcycle. The story breaks the motorcycle riding experience into two broad categories: dressing properly and the responsibilities facing all riders. Hint: You’re not just sitting there — you’ll have to pay attention and participate! Your life and the life of the motorcyclist may count on your active role as a rider! Dressing properly: The author provides a brief overview of the three kinds of fabric worn for motorcycling — leather, Cordura brand and jeans. Once you know the options, you can select the equipment that is best for the conditions. 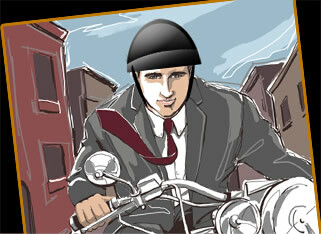 Getting ready to ride: Motorcyclists must follow a series of safety procedures before riding. And that means the driver AND the passengers. “To maintain the stability of the vehicle during driving, the passenger has to stay within a certain viewing angle of the pilot’s head, so the passenger can anticipate the maneuvers and track key movements – including the inclinations necessary during cornering. “In motorcycle braking, when the body of a passenger is projected forward, he or she must press their hip against the pilot so that it does not suffer the weight transfer and lose balance. As an added bonus, the author provides a bunch of links to websites that will help the novice rider become a safe passenger. I strongly recommend all Twin Tiers motorcyclists, drivers and passengers, take some time to review the safety links here as we gear up for motorcycling season. Remember, your passengers are not just along for the ride! They’re your co-pilots and they need to be an active participant every time they ride! Thanks for reading, and remember to ride safely this year! This entry was posted in Motorcycle Helmets, Motorcycle Safety, motorcycles child passengers, New motorcyclists and tagged accident attorney, accident lawyer, Adam Gee, Adam M. Gee, American Motorcyclist Association, Elmira New York, Helmet, injury, Motorcycle, motorcycle accident, Motorcycling, New York motorcycle attorney, NY and PA motorcycle lawyer, NY biker lawyer, NY motorcycle accident lawyer, NY motorcycle attorney, PA motorcycle accident attorney, PA motorcycle lawyer, Pennsylvania motorcycle accident attorney, Road traffic safety, Twin Tiers, United States. Bookmark the permalink.